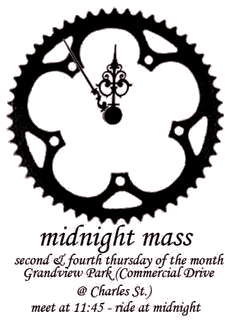 Vancouver Critical Mass: World Naked Bike Ride Redux! World Naked Bike Ride Redux! 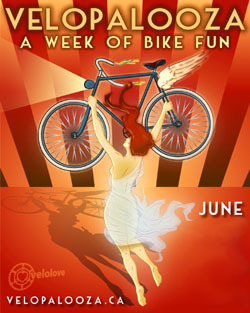 After bad weather last Saturday, the Vancouver World Naked Bike Ride is back again this Saturday, June 21! Join tens of thousands of cyclists around the world and experience the exposed joy and participate in the world's largest naked protest against oil dependency and car culture! The ride is bare as you dare, so fear not. All that is needed is a sprinkle of colourful courage. Together we'll spread waves of happiness and contagious smiles across the city. So join us for the most fun event of the year. Meet Saturday, June 21, 12:00pm Noon at Sunset Beach (near the corner of Beach Avenue and Bute Street) for body painting and performances with the ride itself starting at 2:00pm. A picnic follows the ride, hosted by NIFTY. The ride and all ride activities are free. • Prepare for riding rain or shine! • If sunny, put on sunscreen! • You do not have to be fully naked to join the ride. • If you are shy, the ride will start off clothed. There will be an opportunity to dress down after the start. • Keep your clothes with you – you never know when you may need them (like... after the ride). • Decorate your bike! Come with signs and funky hats! Cover your bike seat with fun fur! • Ride safely and stay together as a group. Tell your friends and spread the word!! Fwd: Last chance to support Graham!